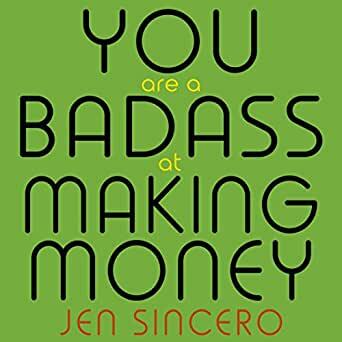 You Are a Badass at Making Money is the book you need if you've spent too much time watching money land in your bank account and then roll through your fingers. Jen Sincero went from living in a converted garage to traveling the world in five-star luxury in a matter of years and knows all too well the layers of BS one can get wrapped up in around money, as well as what it takes to dig your way out. In this funny, fascinating and practical book, she goes in-depth on how powerful our thoughts are and how our bank accounts are mirrors of our beliefs about money. You Are a Badass at Making Money combines laugh-out-loud comedy with life-changing concepts, all boiled down into manageable, bite-size tips so that you can put them into practice and get life-changing results. This book far exceeds my expectation and is one of the best financial advisory books I ever read. Now I am doing a start-up, something that I never would have seriously committed to without reading this book. If you are serious about changing your life, read "Think and grow rich" and read this book, and your new life lies ahead. 5.0 out of 5 starsLove the way Jen writes. Totally has me enthused! Borrowed from library and then bought it. Love the way Jen writes. Totally has me enthused! Gavin Watts credits his achievements, success and wealth to Jen Sincero's advice and writings and heartily thanks the universe for its love and support!!! 5.0 out of 5 starsLove it Love it Love it! Such a great read and a great pick me up book too!